Happy Friday! I have my packing post for what we packed for a week in NYC during the summer. Most of the time I’m a carry-on traveler and bring my suitcase onto the plane with me, but this round Andrew and I checked two of them! We had one more with us as well for a total of 3 suitcases in the Bigger Carry-on Size from Away (our shoes took up a lot of space). It would have been more ideal if we had larger sizes but we tend to pack last minute and by the time we realized what we needed it would have been to late to order a bigger suitcase. What makes them so good? So many reasons why, but my top three include the design (sturdy, streamlined, no frills, wheels are AMAZING), interior fits a lot, and price point. Mine were gifted but since I discovered them I’ve purchased close to a dozen on my own as gifts for family. Which size do you recommend? I recommend the Bigger Carry-On if you’re flying in the US. European airlines often have different luggage restrictions so if you’re traveling through Europe I’d recommend the Regular Size. What’s the size difference? They have all the dimensions on their website along with weights. The difference is slight but enough to be noticeable when you’re trying to fit more stuff inside! Which size do you carry with you? I’ve carried both, but usually the Bigger option. Does the exterior get scratched if you check it? Yes, it will get scuffed and ours have a few scratches. But they hold up remarkably well. Can you clean the outside? Yes, if there are markings you can use a Magic Eraser + warm water or a little dish soap. Away often has more tips on their Instagram stories! Where can I find the mini Away case and what does it look like inside? It’s not available right now, they launched them during the holidays so I’m hoping they will be back again later this year. What it looks like inside in this post here. Quick notes about the charging battery – Some airlines have changed their policy about having charging batteries on the plane. We’ve flown Delta and they stopped my husband at the gate, asked him to take everything out to unscrew the battery because he had the older style that doesn’t have a pop-out battery. We’ve also flown Jetblue and they didn’t stop or check anything! Check with your airline to see their policy. If you have an older style Away suitcase they have a page with some information you might want to check out. They’ve also launched a battery switch program with a few options. Onto what I packed for a week in NYC. I’m usually pretty good at editing what I bring. This round I didn’t pack enough sweaters or warm clothes. Summers in NYC are pretty warm but this year has been a really odd year for weather all along the east coast. During our stay in New York, we had some really cold rainy days mixed in with super hot days. I thought about buying a proper jacket, but decided to make what we had work! Living in South Florida there are very few days where I actually have to wear a jacket. I have my packing split into two parts: clothes and beauty. Clothes I packed for the entire trip below! Outfits are laid out in the collage below. I didn’t get actual outfit photos of everything in the city but we did snap most of them! I’m going to try and be better about getting more for you in the future as some of you have mentioned it’s helpful to see them. Some of the shoes I changed mid-day. The only things I didn’t wear were the dress and heels. We tend to travel casual style so I often don’t pack anything formal or dressy. Also packed but not shown included a Goyard tote, Lululemon clothes for working out (which we didn’t get to), for sleeping this cute black lace camisole + shorts night set from Flora by Flora Nikrooz. Four of my vacation outfits we snapped out and about, I’ll try to get more next time! Some of the days we just had too much fun eating, exploring and meeting with people to take photos. Beauty packing packed into my Daily Edited Large Cosmetic Case, Away Mini Travel Case, Anya Hindmarch Inflight Travel Case and clear Ouai Mini Pouch. FYI full review coming soon, but as mentioned in my previous post this case is a cheaper dupe of the Anya Hindmarch! It’s also available in Navy, Taupe and Pale Pink. What I would have done differently: I think I always have a warm weather state of mine, I often don’t pack enough warm clothes. Weather prediction is tough but for most trips I’ve always needed a warmer jacket. I would have packed one this trip. I also often forget to carry a tote with a zipper. I need to be better about doing this. I have been really lucky that I’ve never had anything stolen but Andrew is always reminding me to not carry my tote behind me as it’s easy for someone to slip their hand inside. Either a closed tote or cross body for city sightseeing or shopping will be safer. Hope you enjoyed this packing post! Do you have any tips or tricks you want to share for packing on week-long getaways? Do you travel with carry-on’s or smaller suitcases or pack a lot? Now that I’ve done a few packing posts let me know what you find most helpful. Sometimes I list everything out, others it’s a more general list. Let me know which version you like the best! Press samples featured include Away luggage, Pat McGrath Lust Gloss, L’Occitane Aqua Reotier, Laura Mercier Concealer, Sisley eyeliner, Hourglass brow gel. I have two travel diaries to share as we’ve spent a few weeks traveling this holiday from coast to coast! Two weekends ago Andrew and I flew to Los Angeles for my bestie’s wedding. We spent a few extra days in town to visit some of our favorite spots and meet up with some family as well. It’s been only 10 months since we left California and I can’t believe a lot has already changed in LA! Lots of new construction, new stores and massive mall renovations. We were in town for close to 3 days. This was a short trip and I wish we had been able to stay a full week but hopefully we will be able to travel back to the West Coast in the new year. Trip highlights and photo diary below! For this trip Andrew and I stayed at Mr. C Beverly Hills and had an amazing stay. This was our second time staying at this hotel and it couldn’t be more perfect. I’ve stayed at a number of hotels in Los Angeles before and this one has been my favorite. The hotel has beautiful rooms, excellent service, amazing views and it’s also located in a great spot in Beverly Hills. It’s clean, modern, romantic and just lovely. Travel beauty shelfie: let me know if you want the full beauty pack list and I’ll try to do a separate travel beauty post. In the meantime you can see my Travel Beauty Cases post here. What I packed on previous trips in my Dallas Travel Diary and San Francisco Pack List. I tend to repeat a lot of items. I traveled with the Dyson Supersonic Dryer for the first time and found it was absolutely essential for me. It will definitely be going on future trips! If you buy one make sure you find a good storage case for it. The one I have came with a pouch. I think the hard case version will probably be more ideal to protect it. View of the Hollywood Sign from Beachwood Drive. If you’re driving along this street make sure you don’t keep going straight up into the hills! Turn off before you reach the hill otherwise you’ll get stuck like we did. The streets are narrow and windy and it took us forever to find our way back down! Westfield Century City is a newly renovated mall and it’s amazing! There are still a lot of stores under construction with “coming soon” signs but there is a lot to find there. It’s especially great if you want a central location to shop with a lot to offer. The Nordstrom there has the most amazing beauty department I’ve seen in the US – they have Tom Ford, a Space NK wall, Atelier Cologne, Frederic Mall, a Natural Beauty section and so much more. We also stopped by a few boutiques including Penhaligon’s and Aesop. The Aesop store is just so beautiful – all of them are! The staff is genuinely friendly, helpful, non-pushy and knowledgeable. One evening we had dinner in Venice Beach on Abbott Kinney. I made a quick stop inside Hourglass store to see what was new. Anxiously waiting for spring launches! Also on Abbot Kinney is an amazing Smashbox store! They have a lipstick bar and lipstick wall, it’s incredible. I highly recommend stopping by. Unfortunately I didn’t get many good food pics as the times we ate we were in dark restaurants or in a rush and didn’t get a photo! As a junk food junkie I’ve been dreaming about In-n-Out for months. I had been dieting for weeks beforehand to be able to eat junk food on our two recent trips. We ate at In-n-Out twice, had Mr. C room service a few times which was AMAZING (best burger I’ve ever had), dinner spots included Gjelina and Marino. Gjelina is one of my favorite restaurants of all time. In the event you aren’t able to get reservations and don’t want to wait for a table (dinner can get busy) there’s a take out Gjelina right next door. I packed an Away Carry-On with a few outfits, makeup, skincare and my Dyson Supersonic Hair Dryer. I definitely over packed but didn’t quite pack the right clothing for the weather so I’ll share what I actually wore. I’ve also come to the realization that I need a wardrobe makeover for travel. Living in South Florida I’ve been living in super lightweight clothes, sandals, shorts, dresses because it is HOT here! For the rest of the country it’s really not warm enough to wear what I have right now. Funny how quick we can be to forget what real seasonal weather can be like. Although I do have to say I’ve always lived where it is sunny year round. One snapshot I have from Laura’s wedding, thanks to Jessica Alexander for the photo! Laura wearing a chic white dress from ALC, I’m wearing Majorelle. Prosecco and chocolate strawberries courtesy of Mr. C Beverly Hills! We’ve never been treated with such a surprise before! We had a lovely stay and it was great to be back on the West Coast. There were a few things we would have done differently if we could have a do-over on the trip. If you plan visiting LA from out of town and are going to stay mainly in the Beverly Hills area I’d recommend you Uber instead of renting a car. Any hotel in the Beverly Hills area is going to have pretty high overnight parking fees and the traffic in LA is pretty stressful no matter where or when you’re driving. Not to mention finding street parking adds more stress. I’ve driven to LA from San Diego for events and weekend trips a number of times and my brother has recommended I take the train instead and Uber around the city to save time and stress from parking. That being said a lot of things are spread out in Southern California sometimes having a car is essential. We probably would have booked 2 more days to be able to take our time, see more places and visit more with friends/family. I think if we had 4-5 full days it would have been plenty of time. Shopping-wise I would have planned out my stops a little better. Abbot Kinney on Venice Beach has grown so much since I’ve last been there. I would have definitely allocated more time to walk the streets and browse. There are a lot of beauty boutiques there like Aesop, Caudalie, Hourglass, Smashbox and lot of clothing stores there. I think the Century City mall is quite amazing though. We would have probably skipped visiting Santa Monica. I think it’s great to see once, but we’ve both been there so many times seeing it again was a bit redundant and it was pretty far from everything else we wanted to see. Take some time to just sit back and do absolutely nothing! This is something we both need to work on. When we travel we tend to travel for adventure and I pack in a lot of things. Sometimes I need to remind myself to slow down and take a break. Hope you enjoyed this travel diary! I’m working on my Miami trip post but probably won’t have it up until the end of the week or early next week. Stay tuned for more beauty posts soon! Do you have any favorite LA spots? Media rate was provided by Mr. C Beverly Hills for feature. I have my first holiday gift guide of the year! Today I’m rounding up some of the best travel beauty cases and makeup bags I love. If you’re in need of ideas for a fun unique gift, I think any of these would be great gift for the beauty lover or frequent traveler. 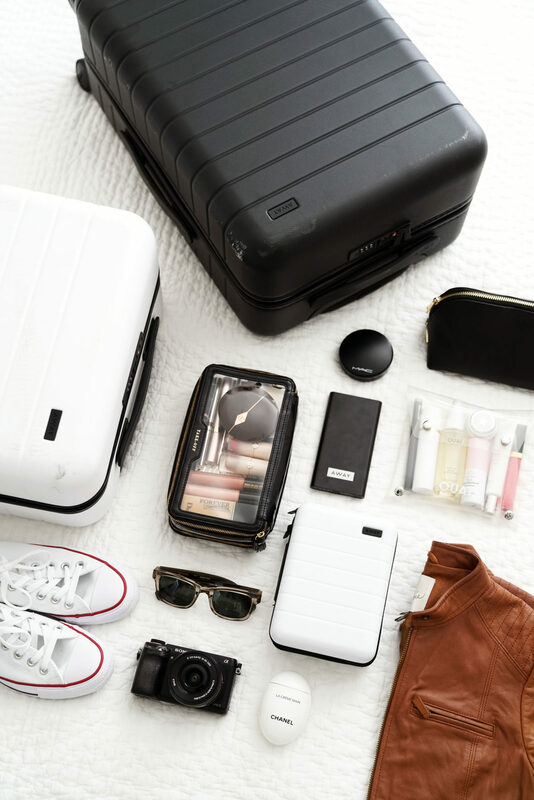 When it comes to travel prep I’m always looking for good storage and packing solutions to organize and carry my things, especially beauty items. I’ve tried a lot of different options over the years. Many times I’ll use the freebies from gift with purchase events, but sometimes it’s nice to have something a little better quality that’s sturdier. If you’ve followed my packing travel posts you’ll probably recognize several of these bags. I’ve put each one to the test on different kinds of trips. I’m primarily a carry-on traveler so in general I’d say these bags work best for shorter trips. Quick note that all the cases come empty with the exception of the Away Mini Suitcases, but I’ve filled all of them with some of my favorite things to help show what you can fit inside. I hope this helps decide which option is best for your needs! Bobbi Brown Beauty Case ($160, measures 6.406″ L x 3.844″ W x 8.609″ H) is something that has special meaning to me as Andrew gifted me a black leather case many years ago when we were in college. This was in our early dating days before he knew I was a beauty junkie! He found it at the airport in London before he flew back home one summer. It was the perfect gift and I used it for many years (I still have it!). Each year Bobbi Brown has released a new version. This year’s is a beautiful deep red. You can see everything that I fit inside the 2016 version which is nearly identical to this year’s inside. I have actually fit this inside a carry-on suitcase in previous years, but as you can imagine it does take up a lot of room. For weekend trips it’s perfect. There have been times I just packed a weekender bag and this case. My black leather one has held up remarkably well. It can get dirty inside, especially if you store dirty brushes or have powders that spill. Mine has been relatively easy to clean with a damp cloth and canned air. Canned air works wonders to remove debris from almost anything! This one has two levels, a top tier that can hold brushes or skinny perfumes and then a sectioned portion to hold compacts, liquids or lipsticks. The base is bigger/deeper so you can stack more inside. There is a nice gap on the top of the bottom (if that makes sense) so there’s a lot more room than you might think. Anya Hindmarch In-Flight Travel Case ($275, measures 8.7″D x 3.2″W x 4.7″H) is one of my most expensive makeup bag splurges. I can’t remember the exact date that I bought this but I know I’ve had it for over two years. It’s clear and has two zippered sides, one for Take-Off and one for Touch-Down. You can really put anything you want in it, but for flying it’s nice to have two sides to separate items so you don’t have to dig around your makeup bag to search for things. This bag has gone through a lot of travel and still has held up really well. It’s been through quite a bit of squishing, packing and use. Many of you have asked if I think this purchase was worth it. In this case I don’t know that I can say it’s worth the price tag because it’s soooo expensive, but it has held up a lot better than I anticipated, especially since it’s made of clear plastic and patent leather. So that being said I’m still 100% happy with this splurge because the quality has proved to be excellent. A closer look at both sides, on the Take-Off side I can stack 3 compacts flat to fit inside. The Touch-Down side is skinny in the opening but can still hold long tubes like Chanel glosses, cream shadow sticks, etc. Ouai Clear Envelope Pouch ($25) is currently sold out on their website which is the only place I could find to buy it. Right now you can buy it in their Under the Mistletoe Set. I’m hoping they restock eventually because it’s a great large flat pouch! Do note that since there is only one button clasp smaller things can be prone to falling out if you stuff it (versus a zip bag that won’t let anything spill). But for medium to larger size bottles it’s great! What I’ve fit inside below: Ouai Wave Spray, Ouai Hair Oil, Ouai Smooth Spray, Sunglasses, Byredo Hair Perfume in Mojave Ghost, Oribe Gold Lust Dry Shampoo Mini, Oribe Swept Up Powder Spray, Fresh Sugar Lip, Atelier Cologne Minis, mini L’Occitane Divine Cream. I think the world needs more clear pouch options – they’re so handy for everything! The Daily Edited is a brand I discovered earlier this year. Their entire line is designed so you can have it customized and monogrammed! I ordered three items: one Black Large Cosmetic Case, one Taupe Large Cosmetic Case ($100 each, measures H 5.3″ x W 8.9″ x D 4.3″) and one of the Travel Cases ($120, measures H 5.9″ x W 9.4″ x D 3.5″). I have by initials in the blind embossed style SS. These are made of Saffiano Leather and are decent in quality, but the lining is not the best on the market. For something in the $100 range these are very good and I feel the large cosmetic cases are the best ones I’ve tried in terms of size, proportions and function. They are sturdy but the leather isn’t as thick or stiff as some other luxury brands so it’s bendable and prone to slight stretching in areas. Based on the occasions that I’ve used mine I just don’t think it’s something that will last as long as say something from Louis Vuitton. That being said, I do understand if you throw something in a suitcase packed with other items it’s bound to get smashed or worn so this isn’t a deal breaker for me. I brought one of the large bags with me on my trip to San Francisco and felt it was perfect in shape/size. It gets the job done and even though I think it could be better quality these are among my favorites for the style. I’ve also used the Large Travel Case and it has an upper portion with compartments and leather straps with holes. This seems to be perfect for someone who wears a lot of jewelry or travels with different pieces. You can store earrings and also keep items separated. I’m a minimalist when it comes to jewelry, especially with travel as I’m always worried I’m going to lose something so this part didn’t really appeal to me. There’s a bottom portion that’s larger where you can store beauty products, compacts or other accessories. For an all around travel case it’s beautiful. For beauty I’ve found other options better suited to what I pack but it is a beautiful case and I can see many people using it for accessories, jewelry, etc. Away Mini Suitcases are back this year! If you remember last year they had the Grey/Asphalt color as gift card cases which were super cute. They measure 7″ x 5″ x 3″ and this is the first year they’ve offered them to the public in 10 different colors, including their winter colors Frost and Pool. Each mini is available as a stand-alone for $35 or free with the purchase of a gift card. There are also some curated sets ranging from $45 to $95 packed with some of their TSA-sized essentials. Shown below are White, Asphalt and Brick Mini Suitcases next to the Away Carry-On (the black one been well-loved by my husband, this is the original one they launched back in 2015). You can buy all of these directly from their website Away Travel or one of their stores (New York, San Francisco, LA and Austin so far). Each one has the same interior which has a grey mesh pocket and open inside, much like the Away suitcases. Below I have a closer look at the interior and some of the fun curated options they have. You can mix and match the colors in any of the sets. Right now they are sold out of the Beauty Set and Essentials Set but I’ve been told they are going to restock soon. The pink one is going to be restocked (they hope next week!). All others are limited-edition while supplies last. I love that these come wrapped in a drawstring cloth sack – it’s an extra special touch that makes these so cute. I was gifted 3 and promptly ordered a bunch more to give as gifts this year. Cameras shown below include the Leica Sofort Instant Print Camera and Sony NEX-6 (discontinued, current model is Sony A6000 Camera ). You can also see my Dyson Supersonic Hair Dryer review here (and yes I still think it’s my favorite). So many of you have asked for a look at the inside of these cases so are more photos. They plan on restocking the sold-out sets around next week so keep an eye out for them! For now you can still buy the Individual Mini Suitcase in all the colors for $35 each (some have sold out, but pink is going to be restocked). Truffle Clarity Jetset Cases ($85 each, measures 7 1/2” L X 5 1/4” H X 2″ W). They launched non-flat pouches this year and I was thrilled! I ordered two of the three colors for myself and really like how they are constructed. They are on the expensive side for the size but I think they’re great for throwing in your carry-on tote. I find the quality pretty good and there’s enough structure to it that it will retain its shape well. I didn’t want to love these at the price but now that I’ve purchased two I’m really glad that I did. I’ve been a fan of the flat pouches for such a long time it’s nice to see something with more depth! MAC Clearly MAC Large Rectangle ($30, measures 8.5″ x 5.38″ x 5″) is one of the more affordable clear bags that I own and think it’s sturdy and well made for the price. They’ve had several variations over the year and this is the current one. They also have the Clearly MAC Rectangle ($26, measures 9.25″ x 3.5″ x 3.38″) which I’ve had on my wishlist for brushes. I’ve tried a number of brush rolls in the past and while they’re great – sometimes I just want something more basic, simple and open. View of the front, back and side – it’s pretty roomy! Net-A-Porter Holiday Beauty Kit ($115) is one that I do not own but spotted it online for one of their holiday kits and it looks like a steal! If you’re budget is around the $100 mark and want to gift a little bit of everything this kit has just that. The clear case looks promising for travel as well. That wraps up my gift guide on favorite travel beauty cases for carry-on travelers. If you have any friends or family that already have all the beauty products and you’re stumped on what to get them, I think a makeup bag or travel case is a great alternative. This week’s giveaway is going to be a Bobbi Brown Beauty Case + Away Mini Suitcase in Brick! I bought a Bobbi Brown case but was also sent one as a press sample, so I’m giving away my extra. I also ordered a ton of the minis to give away as gifts and I’m adding one to this giveaway. As a bonus I’ll be filling both with some makeup goodies but the picks will be customized based on the winner’s skintone, skintype and preferences. This giveaway is open internationally but you must be 18 years or older to qualify. Simply follow any of the tasks provided in the widget below. Do you have any favorite travel makeup bags? Are you a carry-on traveler or do you check your suitcases? Stay tuned for more gift guides, Black Friday and Cyber Monday Sales Roundup and more! Press samples include the Away Mini Suitcases and MAC Clearly MAC Rectangle Bag. Other pouches and bags purchased by me. 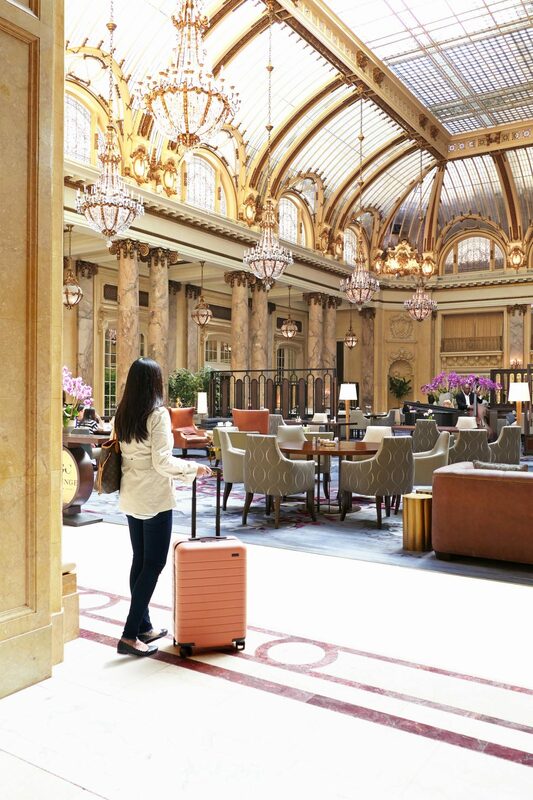 Today’s post is Part 2 of my San Francisco Travel Diary with a review of the Palace Hotel and my pack list with the Bigger Carry-On from Away’s new Stockholm Collection. In past years my husband and I usually stay at the Westin St. Francis on our San Francisco trips because we fell in love with the cute romantic vibe in their Landmark Building. This visit was a girls trip so I decided to try something new decided to give the Palace Hotel a try. The beautiful Garden Court is what sold me – it just looks magical! The reviews looked promising for cleanliness and comfort so I booked a room with 2 double beds. When we checked in they gave us one on the 7th floor with the New Montgomery Street View and it was just perfect. We didn’t hear any street noise and it came with one of the Toto Washlet and with heated seats. The rooms are on the small size which was expected for the city but the room was pristine with comfortable beds, amazingly soft linens, extra towels and really cute turn down service. Upon check-in I was given a small bag of Ghirardelli Chocolates as they have a store right outside the hotel. For me it was a win right from the start! We wanted to try the Garden Court for tea but didn’t make it this round, the lighting is just so pretty. If you look up you can see there’s another floor with a room which we assumed was reserved for special events or weddings. We tried to find the door to it but could not. There is a pool and a nice gym on the 4th floor which we took a peek at – we didn’t get to use it though as each day we did quite a bit of walking. Enough to wear us out completely! A look at the room we booked, cute hallways on each floor! What I packed below. As mentioned in Part 1 – both Laura and I under packed for the weather. She flew in from Los Angeles and I flew in from Tampa where the weather is in the high 90s. Our clothes simply were not warm enough for what we’re used to but we made it work by layering. Since 75% of our outfits were too cold we re-wore a lot of our sweaters and pants. I brought the Away Bigger Carry-On in Clay which is the perfect warm clay pink color. It’s part of the Rashida Jones Stockholm collection with 3 limited-edition colors, Packing Cubes and a Stockholm tote (new current packing cubes here). My husband is the organized one who knows all the packing tips and tricks to make life easier so he bought me packing cubes for our Europe trip a few years ago. They do indeed help organize things but they’re not really the most aesthetically pleasing. It’s a minor detail but these Away cubes are the prettiest ones I’ve seen. I’ve already ordered a few more packs. tech stuff like laptop charger, phone cords etc. Before I go into my beauty pack list, here’s a look at the Bigger Carry-On next to the Stockholm Tote. The tote is made of “water-resistant nylon with vegan leather details and featuring a zip top, an exterior pocket, interior laptop sleeve, two interior snap pockets, and a removable zippered pouch that fits the really big iPhone.” I didn’t take it with me on this trip but I wish I had. One of the biggest issues I have with my larger totes is they don’t have good pockets or compartments inside (I should probably invest in an insert at some point!). The Stockholm tote is simple, streamlined and functional with enough pockets to store essentials for easy access. The depth is quite roomy so you don’t have to feel like magazines and your laptop are stuffed inside. A look at my suitcase opened with the tote laid on top for size reference. I received the Cactus Packing Cubes from Away and for this trip I only used 3 of the 4 in the set. There are different sizes so you can organize literally everything. Shown below on the left is the Daily Edited Large Cosmetic Case in black (largest one one of the best travel makeup cases I’ve bought! ), Leica Sofort, Sony NEX-6 (discontinued, old model), Marc Jacobs Rimless Aviators (current style here). On the right is a Glossier Pouch (you usually get them with your orders), Truffle Mini Clarity Clutch, mophie Powerstation Mini (2,500mAh) – White , Here Magazine and a Sugarfina Cube of Pineapple Candy. A few notes if you’re shopping for luggage and missed my previous reviews on Away. I discovered them in 2015 when they only had 1 size (the Carry-On) and have used their suitcases exclusively for the past few years because of the streamlined design, sturdy exterior, charging component in carry-on and for their really good wheels. I’ve literally bought all my loved-ones suitcases as gifts and converted them all to using them as well! I’ve tried both the regular Carry-On which is best for international flights and the Bigger Carry-On which works on most US Domestic Flights. You can see a size comparison with dimensions on their website here which is really helpful – they’ve done the research to help you decide! As a carry-on traveler this really can fit a lot inside because the handles, battery and wheels don’t consume a lot of space on the inside while a lot of other brands do. I have checked these on occasion even though I usually do carry-ons. My husband has checked his a lot too. They are prone to scuffs and scratches, but really anything you check is bound to get scratched. With mine I used it on 3 back to back flights and it didn’t get any deep scratches. For surface scuffs the team at Away recommends you use a Mr. Clean Magic Eraser and warm water to remove them and for me it works like a charm. My skincare lineup shown below. Believe it or not all of my liquids did indeed fit inside a single quart size bag. I had to play around with the arrangement like Tetris a few times to make everything fit as I’m a carry-on traveler. If you’ve been following this blog for years, you may remember that I actually made it through a month-long trip in Europe with a carry-on backpack. I missed having my hair dryer, but San Francisco water is so much better than Tampa water – my hair was naturally shiny and smooth during my trip with air drying! I also packed an assortment of tools like makeup brushes, lash curler and hair brush but didn’t photograph them before unpacking. As usual I packed too much – I did use everything I brought in skincare, but makeup was a bit overdone. I hope you enjoyed this review of the hotel and what I packed! We had a lovely stay at The Palace Hotel – I’d definitely consider staying here again on my next visit. If you travel to San Francisco occasionally where do you usually stay? Open to any and all recommendations! P.S. My posting schedule has been a bit off lately as I’m living the nomadic life right now. I’ll be heading to New York, California (again) and back to Florida in September. Florida life recap post is still coming – I know many of you are curious where/why we are moving and I’ll explain more in a future post. Long story short we now get to explore different areas of Florida and it’s been quite an adventure but an unexpectedly great experience. I still cannot believe how BIG Florida is and since moving here and most of my West Coast friends don’t know how spread out everything is. I have to show them maps to explain how long it takes to drive from area to area. Beauty posts to resume soon. I’ve still been putting a lot to the test to review here! Beauty and skincare press samples indicated with a *. Away Stockholm Collection provided for review. We paid for our room, however a media rate was extended to us by The Palace Hotel for this review. As always all opinions my own. I’ve been a bit MIA as I’m currently in San Francisco for a quick girls trip! It has been quite a few years since I’ve visited San Francisco and I’m beyond thrilled to be back. I’ll have a full packing post, SF travel diary and a little shopping feature coming up soon. In the meantime I’ve rounded up some of my favorite travel beauty sets you can buy right now. I always try to hoard my minis and samples but sometimes they’re just too good to save for trips. I love it when brands have travel sizes or sets available for purchase because then I don’t have to decant anything into mini jars or bottles. I really like original packaging anyways. First I wanted to mention that Away launched a new collection in collaboration with Rashida Jones with three new colors and these are the best colors yet! The launch is called The Stockholm Edition as it was inspired by Scandinavian designs and colors. There are new colors three available in Clay (shown here), Cactus and Violet. Also launched with the Stockholm Collection is a new Stockholm Tote made of black water-resistant nylon and vegan leather. It has a sleeve in the back to slide over the handles of the suitcase for easy carrying. They’ve also launched coordinating colors in packing cubes. Full review to follow soon but the packing cubes are the best looking packing cubes I’ve ever seen while still being super functional. For those who love Away they’ve also launched a new magazine called Here. Up first is haircare. I love travel-sized haircare! Often times it’s what I’ll buy first before buying the full sizes. I think they’re such a great way to try things and I love testing all kinds of shampoos and conditioners. My obsession can get a bit out of hand with all the bottles and jars that accumulate in the shower, but I love minis. The Ouai Morning After Kit at Nordstrom has the perfect size travel items with the Rose Hair and Body Oil, Finishing Creme and Dry Shampoo Foam (also available at Net-A-Porter). For brushes I usually bring a few with me, my favorite travel-sized one is the Sephora Collection Luxe Combo Travel Brush. There’s also a Christophe Robin exclusive to Net-A-Porter called the Essentials Kit with minis of the Moisturizing Hair Cream, Regenerating Mask, Cleansing Mask and Cleansing Purifiying Scrub with Sea Salt. I’ve tried and love all of these but I know some of you may have been hesitant to buy the full size as the price points are on the expensive side. This is a great way to sample them. You can also find some of the mini sizes at Sephora with a mini Cleansing Purifying Scrub, Detox Ritual Hair Kit and Regenerating Hair Ritual Travel Kit. In skincare, Tatcha has the best travel sizes. The packaging is well designed and they have good sizes for several days worth. I’ve already bought and featured the Starter Ritual for Normal to Oily Skin (currently sold out). Below is the Starter Ritual Set for Normal to Dry Skin with travel sizes of the One Step Camellia Cleansing Oil, Classic Rice Enzyme Powder, Essence and Silk Cream. I think these are really phenomenal sets perfect for travel. The Sisley-Paris Subscription Program is one of the best ways to try Sisley skincare at an affordable price. Many of you commented you had already subscribed and kept the minis for travel which I think is genius. I’ve discovered quite a few amazing items from this program. You can see a 6 month review here. Another set I tried recently was the Belif Best Sellers Travel Set. I bought it at Sephora curious about the items in the line as I really liked the Aqua Bomb. I haven’t been able to test everything yet but found it priced reasonably to give the other items a go. Let me know if you want a review! Two sets I’ve been loving include the NARSissist Velvet Lip Glide Set exclusive to Ulta (5 of the 6 colors shown below, all reviewed here). For perfume I wish more brands had travel-sized or purse sized minis. The Jo Malone Cologne Set is one of my favorites. They change seasonally. Mine is from Nordstrom but I suspect new ones will launch come holiday. Charlotte Tilbury skincare can get pretty spendy and her Gift of Red Carpet Skin Travel Kit is a nice way to try a lot of deluxe sized minis at a lower price. This one is TSA friendly with 15 ml tubes of her Goddess Skin Clay Mask, Multi Miracle Glow, Magic Cream, Wonderglow, Supermodel Body and Take it all off. I’ve loved and used up an entire jar of her Magic Cream and tube of the Wonderglow (full size) and they lasted me a very long time. These minis are perfect for travel – I think you can get quite a bit of use out of them too. There’s enough product to get a really good feel for how the product will perform on your skin. One last travel favorite is the Aesop Boston Kit. I’m such a huge fan of Aesop and the kits are a nice way to try multiple things. You can see the full review of this one here. Do you also hoard your minis and samples for travel or do you buy sets like me? I’m a carry-on traveler so I have to abide by the quart-size bag limit. I know many of you check luggage so this isn’t an issue, but as one who prefers to travel light I love it when I can find travel sizes that I can buy for trips. Stay tuned for the SF roundup! I didn’t bring all of these travel sets with me although I did mix and match for 4 days worth of travel. Press samples featured include the Away Stockholm Collection, Tatcha Starter Ritual Set and Charlotte Tilbury Skincare Set. I’m excited to share my packing list, shopping map and beauty haul for NYC! As mentioned in my previous post I was in NYC for 3 full days. 1 day was for a conference, I had 1 full day of exploring and meetings with my friend Cafe Makeup, and then the following day I had until around 12:30 before I had to head to the airport to catch my flight. On my third day I decided to go to Soho for a quick stop at Away in the morning but most stores did not open until 11:00 AM so my shopping/browsing time was a bit limited. Next time I go to New York I will be staying in Soho – the area is just so charming and I could walk around for hours! First a look at what I packed. The weather was mild – by Florida standards it was cold, but in comparison to the winter in San Diego it was very similar. I packed three tops, two pairs of jeans, three jackets and then also had the clothes I wore to NY which included a tank, jeans and a cotton cardigan sweater. Being a high maintenance hair girl of course I packed my hair dryer and flat iron. Since I had just come from a quick trip to Dallas I used a lot of the same beauty products and skincare. In hindsight since I only had one day in between trips I could have flown straight to New York but I was getting homesick and really wanted to see the hubby and fur babies. Luggage, totes and accessories packed included a Louis Vuitton Neverful MM, Away Bigger Carry On (c/o), Truffle Mini Clarity Clutches (navy one c/o) , Glossier Pouch, Anya Hindmarch Inflight Case, Tatcha Travel Bag (discontinued) and a Tumi Just In Case Tote. The Tumi actually folds up into a flat compact square – I stuffed it for the photo so you could see the size. I’ve had this for years (and a few older variations) – they’re great to bring with you just in case you need an extra bag to bring home. For this trip I did check my luggage and many of you have asked how the Away luggage holds up. Between Dallas and NYC I checked it 3 times and it held up really well. No deep scratches and only surface scuffs and dark marks. I asked the reps at the store how to remove them and they recommended warm water and a washcloth or a Mr. Clean Magic Eraser. I did a little demo video on my Instagram stories which you should be able to see until around 6:00 PM EST. The magic eraser method really does work! Of course anything you check will get marks and eventually dents. What I packed here ended up being similar to my Dallas trip, but slightly more edited. I wanted to make room in my luggage to bring home some things and hauls. Most everything fit inside the Away Bigger Carry On. Before I met up with Amy we discussed where we wanted to go shopping. I told her I was open to anything she wanted to see as she was taking the train up to see me for the day. I shared a map I had made last year (minus the tourist spots). I’ve done this for almost every trip I’ve gone on – I map out EVERYTHING from coffee shops, photo spots, restaurants, breakfast places, shops etc. This is an edited version with just beauty as my full maps get very cluttered. Thanks to Amy for asking me to publish this. She did an amazing one for Paris which I highly recommend. We didn’t get to everything on the map – in the course of one day we made it to around 6 places including lunch spots. We took our time, on our priority list was Creed and Bergdorfs and then we said we’d just take the day as it came. The map should be clickable/interactive – I’m not sure how it will look or work on mobile though. Next stop was Barneys New York – how cool is their Mask Bar?! From Barneys New York I bought two Sheet Masks from Starskin in the Diamond Mask and Close Up options, Cremorlab Silk Pearl, and the Peach and Lily Sheet Mask Set. From Bergdorf Goodman I bought a couple cushions from Sulwhasoo (I also ordered the third option from Nordstrom when I got home). Will be testing and report back soon! At Creed I bought my husband the Original Vetiver Shaving Soap and Bowl – he’s been getting more into skincare and shaving and I thought this might be a nice unique gift for him even though it’s about 3x what he normally spends on a shaving soap. They wrapped everything beautifully and even made a couple fragrance samples for him! Some late night shopping at the Sephora in Times Square, they have Tom Ford, Natasha Denona and Pat McGrath. On Instastories a couple days ago I mentioned how many beauty insider points I had. I forgot that I had redeemed A LOT for Drybar and Supergoop goodies. I think I asked for all the sunscreen minis they had lol! Last but not least a quick stop at Byredo. I had looked for the mint Hand Cream Duo at Barneys but they were sold out so I made a trip to the Byredo store on Wooster and it was very minimalist inside. If you’re looking for this you can find it online at Byredo and also online Neiman Marcus. It was beautiful but very sparse. Online and at counters the travel size perfumes come in pre-made sets. Usually you have to buy a set of 3 with the same scents although they occasionally release mixed discover ones. In the store you can make your own 3 piece or 6 piece set but they don’t have all the scents available. I made my own with 2 Mojave Ghost (I’ve had this on my wishlist for over 2 years, I don’t know why I didn’t just buy it earlier) and 1 Flowerhead. They recommend you only carry them inside the leather cases because the glass is fragile. I’m trying to be extra careful with mine as I have broken a couple. Hope you enjoyed Part 2 of my three days in NYC posts! I already can’t wait to go back 🙂 If you have any favorite spots whether it be shops, restaurants, coffee shops, hotels etc please let me know in the comments! I’ll bookmark them for my next trip! Happy Friday lovely readers! I’ve been a bit MIA and have neglected to post on the blog while traveling over the past two weeks. I’m currently trying to get back into the swing of things after taking two quick trips to Dallas and NYC. I’ve been active on Instagram and Instastories and many of you have been sending me some really good recommendations for what to see and where to eat so thank you! I was only in each city for a few days for conferences so I wasn’t able to explore as much as I wanted but had such a great time in each area. I received an overwhelming amount of requests for packing posts so here is the one for Dallas combined with snippets of what I did during the conference. A NYC post to follow soon as well. I flew to Dallas from Tampa to attend my third rewardStyle conference. It was for two full days with day time meetings and classroom sessions combined with three nights of happy hours and parties. While in Dallas I stayed at the Hotel Crescent Court (where the conference was held this year). I had a pleasant stay but don’t know that I would go back. It had everything one could ask for in terms of basics – friendly service, nice concierge, clean rooms, nice facility. The rooms had a bit of a dated feel, but I have no complaints. If you have any favorite Dallas hotels let me know so I can check them out if I go back. I got to hang out with my beauty friend Beauty Professor. We live on opposite coasts now and it’s been a while since I’ve seen her so it was great to catch up! Outfit 4 and 5: I packed two shift dresses that are older styles, both are from Rag and Bone from previous seasons, I love classic pieces that are timeless! The beauty products, makeup, skincare and tools that I packed. I fit all my liquids in a ziploc bag. I’m still trying to get my life together after moving so a lot of my bags and travel accessories are still in boxes. And last but not least for the fun stuff. I only had a limited amount of time for exploring. I stopped by Forty Five Ten with Beauty Professor and fell head over heels in love with the store! They have Edward Bess, Diptyque, Byredo, Cire Trudon and so much more. Now I want a Serge Lutens eyeshadow palette – I could not bring myself to splurge though! As a die hard Diptyque fan I was overjoyed to find an exclusive called 4510. It has a woodsy scent (I will have to investigate about the notes). They also have an Edward Bess exclusive lipstick called Dallas Pink. For those who wanted a haul post, I did a tiny haul. I bought two candles and a chocolate bar from Forty Five Ten. I was able to pick up a few other gifted goodies from the rewardStyle conference from Supergoop, L’Occitane, Collen Rothschild, Topshop and The Daily Edited. I was saving my $$$ for the New York trip (haul details for that one in my New York post to follow next week). I hope you enjoyed this Dallas post! I’ve been going through a whirlwind of emotions over the past few months. We made a huge move across the country at the end of February and while we both love Florida it’s been a process for me to adjust. As I introduced myself to new people during the conferences I hesitated when people asked me where I was from. Tampa is our home for now but my heart is still in San Diego – I have two homes now! I had a very emotional moment when flying back to Florida from Dallas. It’s such a beautiful place and seeing it from the air is just so amazing. As I flew into the bay, I had a few teary minutes on the airplane because part of me just couldn’t believe how lucky I am to call this beautiful city home. A lot of you have asked whether or not this move is permanent and I don’t have an answer. We moved to try something new and to be closer to places we want to travel. We’re in the process of testing it out and will be figuring things out as the months progress. Both my husband and I had been in San Diego for a long time (long before we met each other) so we were ready for a change. There’s so much to explore and so far we love it here. We have a yearning to explore and this was our first step towards active exploration. He’s promised to take some time off work soon so we can go somewhere tropical and I can’t wait. Have you been to Dallas before? What were your favorite places to see, shop or eat?